Why Did People Consider the Titanic Unsinkable? For more information on the 20th century maritime history of the North Atlantic and on those who thought the Titanic unsinkable, see The Hunt for Hitler’s Warship © 2015 by Patrick Bishop. It is available now from Amazon or Barnes & Noble. It seems incredible to us today that anyone could believe that 70,000 tons of steel could be unsinkable, and specifically the Titanic unsinkable, but that was the conventional wisdom of 1912 belief. 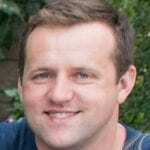 The information on this page will seek to look at some of the reasons why people at the time had that belief. The shipbuilders Harland and Wolff insist that the Titanic was never advertised as an unsinkable ship. They claim that the ‘unsinkable’ myth was the result of people’s interpretations of articles in the Irish News and the Shipbuilder magazine. They also claim that the myth grew after the disaster. Yet, when the New York office of the White Star Line was informed that Titanic was in trouble, White Star Line Vice President P.A.S. Franklin announced ” We place absolute confidence in the Titanic. We believe the boat is unsinkable.” By the time Franklin spoke those words Titanic was at the bottom of the ocean. It would seem that the White Star Line President was also influenced by the ‘myth’. It is difficult to discover exactly where or when the term ‘unsinkable’ was first used. Listed below are some possibilities. An extract from a White Star Line publicity brochure produced in 1910 for the twin ships Olympic and Titanic which states ? ?these two wonderful vessels are designed to be unsinkable. Some sources state that this wording was used on an advertising flyer while others point to an illustrated brochure. 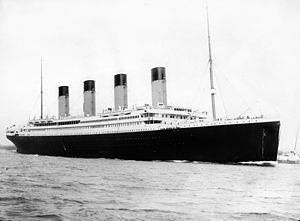 The White Star Line insist that the words used in the publicity brochure (shown above) only point to Titanic’s being designed to be unsinkable, not that it was claimed to be unsinkable. 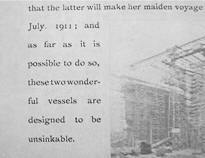 On June 1, 1911, the Irish News and Belfast Morning News contained a report on the launching of Titanic’s hull. The article described the system of watertight compartments and electronic watertight doors and concluded that Titanic was practically unsinkable. In 1911, Shipbuilder magazine published an article on the White Star Line’s sister ships Titanic and Olympic. 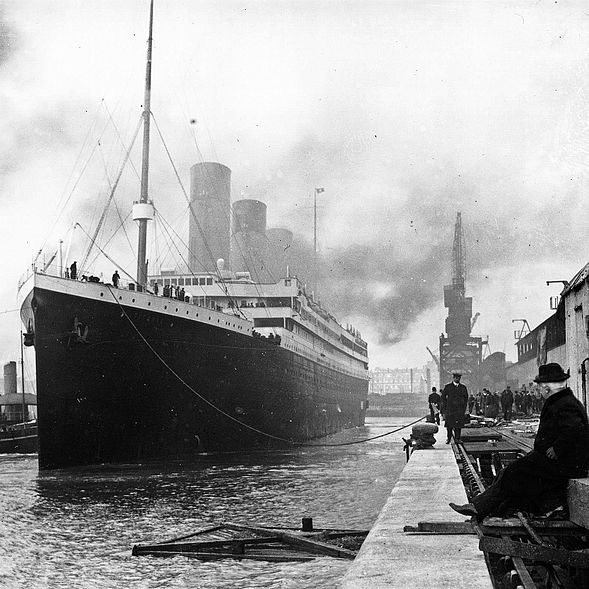 The article described the construction of the ship and concluded that Titanic was practically unsinkable. “God himself could not sink this ship!” This quotation, made famous by Cameron’s film, is reputed to have been the answer given by a deck hand when asked if Titanic was really unsinkable. Whatever the origin of the belief, there is no doubt that people did believe Titanic to be unsinkable. It was the beginning of the twentieth century and people had absolute faith in new science and technology. They believed that science in the twentieth century could and would provide answers to solve all problems. The sinking of the ‘unsinkable’ Titanic shattered much confidence in science and made people more sceptical about such fantastic claims. This article is part of our larger selection of posts about the Titanic. To learn more, click here for our comprehensive guide to the Titanic. For more information on the 20th century maritime history of the North Atlantic, and the people who thought the Titanic unsinkable, see The Hunt for Hitler’s Warship © 2015 by Patrick Bishop. To order this book, please visit its online sales page at Amazon or Barnes & Noble.